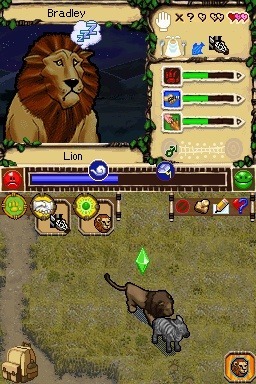 SimAnimals Africa carries in the footsteps of the original SimAnimals by granting players a little piece of the African savanna, and challenging them to reinvigorate the barren environment by becoming a horticulturist and animal tamer all in one - basically, it's up to you to attract new animals to the area with the right selection of plants or other animals, and then convince them to stay by tending to their every whim. 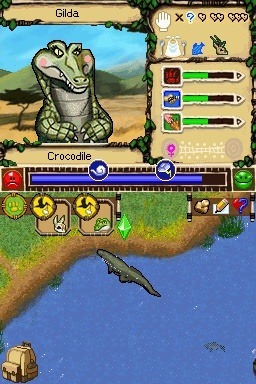 If you've played SimAnimals, you'll know what to expect, as Africa is essentially said game with a new coat of paint. 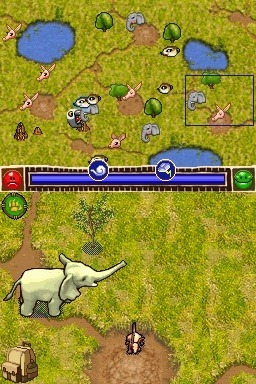 The game is played from a top down perspective, with the touch screen showing a very simplistic representation of each animal as it wanders around the landscape (which, itself, leaves a lot to be desired from a purely visual standpoint) performing as your expectations of each animal should. 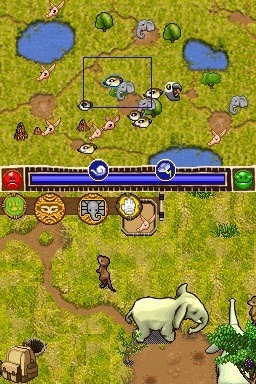 The top screen then is an overall map of your location, with small icons representing where animals, trees, and bodies of water are located. Your first animal "friends" are a meerkat and an aardvark, with animals coming with a sort of Viva Pinata-esque requirement system in order to add them to your inventory (meerkats require a certain amount of grass to eat, and so on). 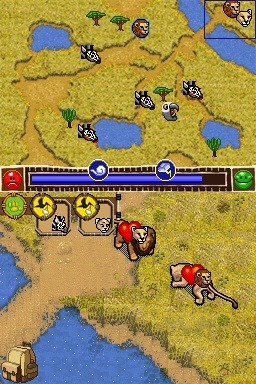 Each animal can be customized in terms of name (and eventually color), and can be moved around the playing field at will by touching and dragging them with your stylus. The same goes for the large amount of plants, berries, and other food items you'll come across - they can be dragged wherever you so choose to customize the look of the landscape. The rest of the game supports the same basic tap and drag/shake mechanic. To grow grass you'll need to shake an existing plot to disperse the seeds that will grow more; shake a tree to get seeds that can be planted; tap and hold over a body of water to form a rain cloud that can be used to water plants (shake the cloud and you get a storm complete with destructive lightning). It's a simplistic control scheme that works well for the game's younger target audience. 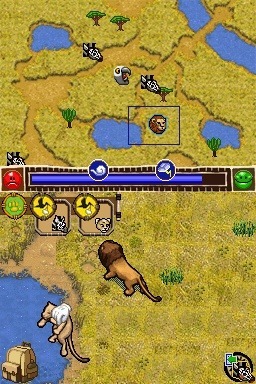 As the goal of the game is to return the African wild to its former glory, you'll need to increase the local animal population, not through just attracting single members of different species, but by encouraging your current animals to breed. 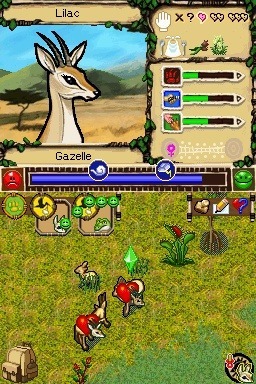 Your overall progress is achieved via a stepwise mission system that has you tending to the particular wants and desires of one animal before moving onto the next (if you don't want to tackle these missions, there is no real requirement to, but you'll never unlock new locales and items without first pleasing the animals already in your possession). These missions are incredibly simplistic, and see you taking care of the basic needs of an animal: drop some seeds, create some grass, or catch some butterflies for it to eat, make sure it has enough water or shelter. You'll find yourself repeating the same sets of tasks ad nauseam until two animals breed, and you have a handful of baby critters running around the landscape. 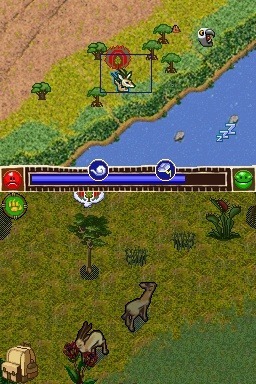 Each animal's happiness level is easily raised, and the missions are quickly passed, at which point all purpose in playing the game virtually stops. You can continue to feed and pet your animals for as long as you wish even after you've stopped being told what to do, but there's no incentive to do so. One of the best things about traditional Sims titles is the sheer amount of items with which you can customize your environment or with which your Sims can interact. Here, the focus is placed so heavily on realism that it falls into the realm of boredom rather quickly. It's unfortunate that SimAnimals Africa lacks so greatly in replayability, as the game's nature-centric message and included miniature encyclopedia are quite educational and refreshing for a children's title. However, the game's lack of content is a definite deal-breaker, as once you've made your way through the scripted missions, there's simply nothing left to hold one's interest. Special thanks to Angie Newman and EA for providing a copy of this title.